Over 20 percent of women and 10 percent of men experienced migraines or other severe headaches within a three-month period in 2009, according to a National Health Interview Survey. Although the most common contributing factors, such as stress, anxiety, overworking and under-sleeping, are not diet-related, certain foods, including meat, can trigger or worsen headaches in some people. If your symptoms are severe or long-lasting, seek guidance from your doctor. Tyramine is a substance produced in various foods that can trigger migraines and tension headaches, which affect up to 78 percent of the general population, according to the University of Maryland Medical Center. Numerous meats, including fermented and poorly stored meats, are particularly high in tyramine. 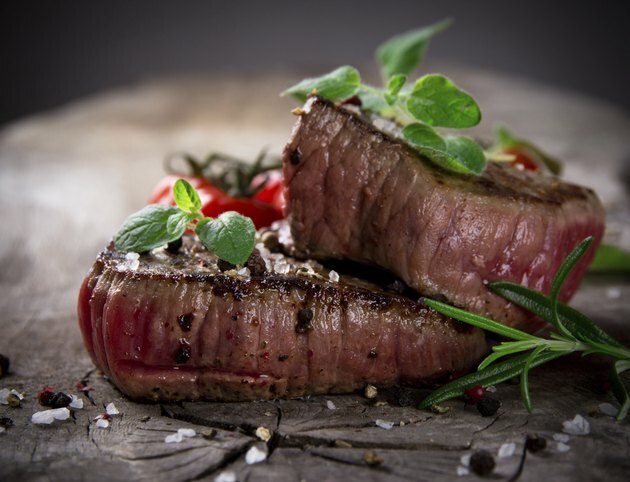 If you are on the verge of a headache, eating tyramine-rich meat may trigger its onset. If you already have one, the meat may worsen the intensity or endurance of your symptoms. To maintain low tyramine intake, the National Headache Foundation, or NHF, recommends avoiding fermented sausage varieties, including pepperoni, salami, summer sausage and mortadella, and limiting processed meats to 4 ounces per meal. In addition to sausages, processed meats include hot dogs, deli meats and bacon. Bacon and other cured meats, such as ham, contain substances called nitrates, which may also contribute to headaches when consumed in excess. Meat dishes containing cheese, which is another common headache trigger, should also be avoided. Fresh fish, poultry, meats and eggs are low in tyramine and less likely to cause headaches, according to the NHF. If you tolerate dairy products well, fresh varieties, such as skim and low-fat milk and cottage cheese, provide additional low-tyramine protein sources. Soy milk, soy cheese, lentils and beans, other than fava beans, are also protein-rich and low in tyramine. Additional common headache triggers include chocolate, red wine, dairy products, nuts, peanut butter, caffeine and pickled and fermented foods, such as sauerkraut, pickles and canned artichokes. If you suspect that particular foods trigger your symptoms, the University of Maryland Medical Center recommends eliminating them from your diet. If your symptoms then reduce, you may be best off avoiding them indefinitely. If many foods seem to contribute to your symptoms, seek supervision from a qualified dietary professional to ensure that your nutritional needs are met. Why Is Monosodium Glutamate Bad for You?